Wells can sometimes be 150-200 feet deep. A closed loop systems may need multiple wells or it may consist of just running tubing 5-6 feet below the earth’s surface. It all depends on application needed for tubing. Our technicians will be able to diagnose exactly what kind of geothermal cooling system will work for you. When installing a unit of this nature, it’s wise to put the job in the hands of the professionals. 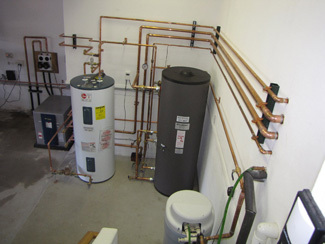 DESCO Services has experience in installing numerous geothermal home heating systems in all kinds of locations. We will make sure to find the right fit for you. Contact DESCO Services today at 717-846-3384 or 717-637-2216 or 717-337-3053.